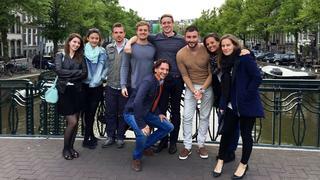 Oceanco pushed the boat out when it treated six young yacht designers to a weekend in Holland recently. The Dutch superyacht builder invited the 2015 finalists of the Young Designer of the Year Award to visit the yard as a reward for their achievements. The finalists – Jake Edens, Isik Goren, Ben Hills, Harun Kemali and Antonella Scarfiello – and award winner Timur Bozca were treated to a night out in Amsterdam before being whisked away for some technical talk at Oceanco’s HQ at Alblasserdam on the Noord river, near Rotterdam. The designers were given a tour of Oceanco’s yard and the new dry dock facilities. They also met with members of the yacht builder’s sales and design departments before receiving feedback on their ‘concept’ presentations that formed their entry for the ShowBoats Design Award for Young Designer of the Year, sponsored by Oceanco. The awards honour the most innovative, elegant and inspiring new yacht designs. The ‘Young Designer of the Year’ award celebrates the best superyacht design from student and trainee designers under the age of 26. Contestants must submit a design that relates to a realistic client request that is then judged by a group of international superyacht designers. This year the Young Designers were asked to design concept for a 55m sailing yacht. After the shipyard tour and talk, the group was taken by water taxi to Rotterdam. They were shown the recently launched 86m sailing yacht, built collaboratively by Oceanco and Vitters, before moving on to the Hotel New York, a landmark building that used to be the headquarters of the Holland America Line, where, no doubt, a lively dialogue about what it takes to be a superyacht designer continued over lunch.